Glass fiber is by far the most predominant fiber used in the reinforced polymer industry and among the most versatile. Although melting glass and drawing into fibers is an ancient technique, long continuous fiber drawn from glass was introduced in the 1930’s by Owens-Corning as glass wool and given the popular name fiberglass. 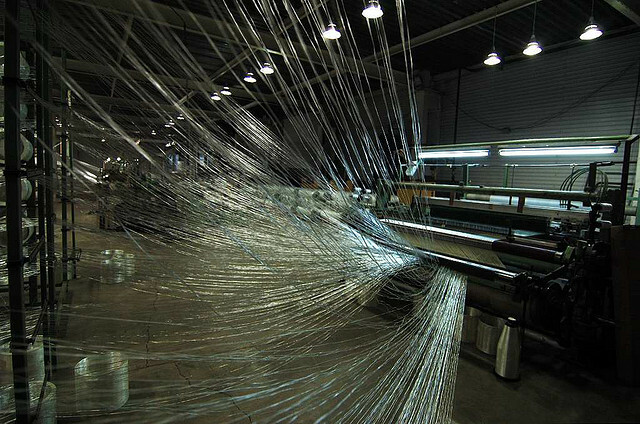 Fibers made from glass are manufactured in many varieties for specific uses. It typically has a silica content of greater than 50 percent, and the composition with different mineral oxides give the resulting product its distinct characteristics. Various glass types are shown below. A-glass - Alkali glass made with soda lime silicate. Used where electrical resistivity of E-glass is not needed. A-glass or soda lime glass is the predominate glass used for containers and windowpanes. AR-glass – Alkali Resistant glass made with zirconium silicates. Used in Portland cement substrates. C-glass – Corrosive resistant glass made with calcium borosilicates. Used in acid corrosive environments. D-glass – Low dielectric constant glass made with borosilicates. Used in electrical applications. E-glass – Alkali free, highly electrically resistive glass made with alumina-calcium borosilicates. E-glass is known in the industry as a general-purpose fiber for its strength and electrical resistance. It is the most commonly used fiber in the fiber reinforced polymer composite industry. ECR-glass – An E-glass with higher acid corrosion resistance made with calcium aluminosilicates. Used where strength, electrical conductivity and acid corrosion resistance is needed. R-glass – A reinforcement glass made with calcium aluminosilicates used where higher strength and acid corrosion resistance is needed. S-glass – High strength glass made with magnesium aluminosilicates. Used where high strength, high stiffness, extreme temperature resistance, and corrosive resistance is needed. S-2 glass – Glass similar to, but with somewhat improved properties with, S-glass. “S-2” is a brand name originally created by Owens-Corning but spun off in 1998 and is now a registered trademark of AGY Holdings Corp. Fibers used for structural reinforcement composites generally fall into the categories of E-glass, AR-glass and S-glass. Of all the fibers available for structural strengthening and reinforcement, E-glass is by far the most used and is the least expensive. Private research as shown that alkaline earth aluminosilicate glass has the potential to produce fibers with an elastic modulus of 100 GPa (14,500 ksi). Glass composites are used where the higher stiffness of carbon or aramid fibers are not required and do not need the high chemical resistance of basalt fibers. Such applications include masonry shear strengthening for in-plane loading and for blast protection.